When Audi made the switch from the traditional swivel wheel controller of its MMI system to a complete touchscreen system, many fans were upset. That’s because there’s a large portion of the enthusiast community that feels touchscreens are too distracting and difficult to use safely while driving. Plus, the swivel wheel had worked for so well for so long that it seemed unnecessary to replace it with a touchscreen. However, after some brief time with it, we’re starting to see the value in this new Audi MMI system. To get a better understanding of the new touchscreen Audi MMI set up, Engadget did a bit of a deep dive on it and it’s a great read if you’re interested in a new Audi but are concerned about the touchscreens. We won’t spoil the entire article from Engadget, as you should go and read it yourself, but we will give you a taste of our own experience with it. We’ve yet to test any new Audis with the new system but we have played with it, while at the New York Auto Show. From our short time messing around with it, we found it surprisingly intuitive, which is unusual for touchscreen systems in cars. It provides both haptic and audible feedback, so you both feel and hear and audible click when you press an icon on the screen. This actually gives the illusion that the entire screen is clicking and makes using the touchscreen really quite satisfying. It also requires quite a bit of pressure for each press to register, which helps with accidental clicks and makes each click more deliberate, making it easier to accurately control. Though, we didn’t use it while in motion, as we only tested it on cars that were stationary on auto show stands. So it was obviously much easier to use than if it were moving. 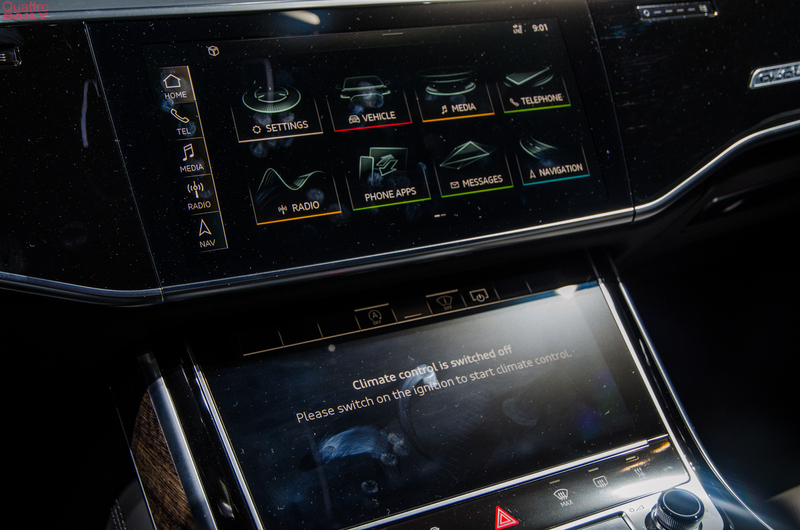 We can also see how some controls, despite the surprising tactile feel of the touchscreen itself, can be quite difficult to use on the road, specifically HVAC controls. If you currently have an Audi and like the way the current MMI system works but are weary of what the new one might be like, check this article from Engadget. The new touchscreen Audi MMI system is probably the best touchscreen unit on the market so, if you can get used to it, it will probably prove to be better in the long run.